Nourishing the Body and Soul With Organic Foods and Christian Faith! Combine the yeast, sugar and warm water in a large mixing bowl (or the bowl of your stand mixer) and let it be for about 5 minutes. When you see the mixture foam up, you know the yeast is ready. Mix in 1 Tbsp of olive oil into the above mixture and whist to mix. Then add in the flour, 2 cups of bread flour and 1 cup of semolina and 1 tsp salt, knead. Add the remaining flour as required, to make a firm, but slightly sticky dough. You can do this step in your food processor. Tip: In most bread recipe you will notice that the flour measurement is always mentioned as a range, never an exact measurement. This is because the flour will absorb water depending on the protein content. The humidity and temperature of the air in your kitchen will also affect how much water goes into the four. So we keep the volume of water constant and adjust the flour as required. ( i had to use about 3 cups flour. If you are using a stand mixer, increase the speed to medium and continue kneading. If the dough seems too dry at any point, add in a tsp of water. If the dough looks too wet, add in a Tbsp of flour. Knead for 8-10 minutes. If you are kneading by hand, knead for 12-15 minutes. Once the dough is ready, make a smooth, round ball of the dough and coat it with the remaining olive oil. Place this in a large bowl and cover the bowl with plastic wrap. I like to use the bowl of my stand mixer, its deep and perfect. Let the dough rest for about an hour or until doubled in volume. Then you may proceed to make pizzas or freeze the dough for using later. Punch down the dough to remove the excess air and cut the dough into two equal portions. Roll each portion into a smooth ball, by pulling and tucking it at the bottom. Cover each piece of dough with plastic wrap and let rest for 20 min. lightly dust your counter or board with flour. Place the dough ball on counter/board and roll it out into a 12 inch circle. brush evoo on pan and sprinkle then sprinkle semolina flour on top. Transfer the circle to your pizza peel or baking sheet. Brush the top of your pizza generously with evoo. Cover loosely with plastic wrap and set aside to rise for half an hour. Meanwhile, preheat the oven to 450 F. Place the pizza stone (if using) in the oven to preheat . If your not using a stone skip that step. Note: Many people say that you should bake the pizza at the highest temperature (500-550 F). But I found that the crust became super crispy and lost its chewiness. 450 F works best for me. Bake for 12-15 minutes. let sit for 3-5 minutes before cutting. 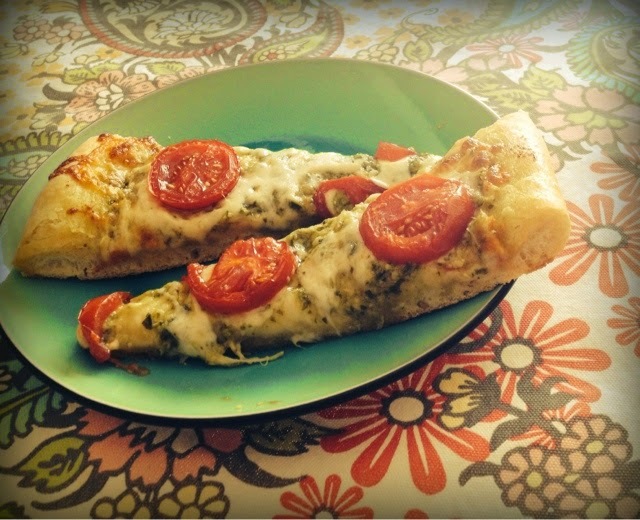 coat a good layer of pesto on crust and top with cheese and tomatoes and olives. I always use mozzarella cheese! 3/4 tsp (or to taste) peppermint extract. Blend all ingredients together except cacao nibs. When it starts to get thick add the nibs. Follow directions on ice cream maker. We use the quisinart. In a small saucepan on the lowest heat possible, melt the coconut oil and gradually whisk in the coconut milk, maple syrup, and cacao powder. The mixture should be both thick and smooth, but not runny. If it is too dry, add more coconut oil or coconut milk. 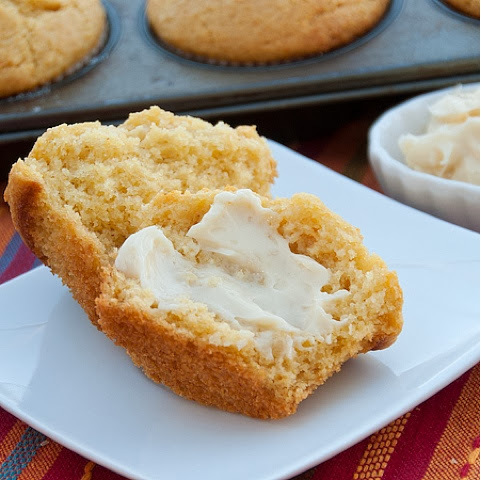 Line an 8×8 glass pan with parchment/wax paper OR alternatively line a cupcake pan with cupcake liners. Pour half the chocolate mixture into the bottom of the pan. Set aside. In a large bowl, mix together the coconut flakes, honey/maple syrup, and melted butter. Scoop the coconut mixture into the pan. Pour the remaining chocolate over the coconut mixture. Then top with the almonds. In saucepan mix all the wet ingredience over low heat till butter is melted. Add to dry and mix well. Bake at 300 for 30 min, stirring every 5-10 min. 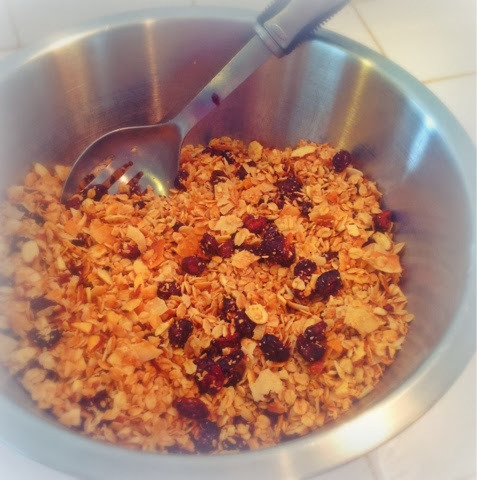 Stir in 2 cups of cranberries when granola is out of the oven. I use apple sweetened cranberries from naural grocers! Combine warm water, honey and yeast. Let stand 10 minutes, or until bubbly. Add salt, gluten flour, oil and 3 cups flour. Mix well, until flour is completely incorporated. Add flour till dough cleans side of bowl and is slightly sticky. Dough should not stick yo your hands. Punch down and shape into loaves. 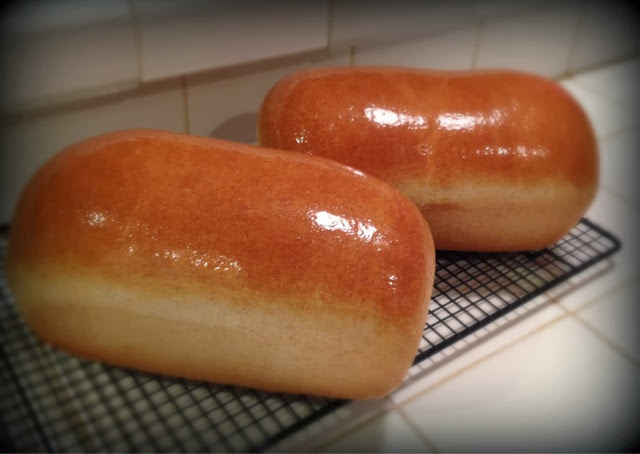 Place loaves in heavily buttered bread pans. Let rise till 1" above rim of pan. Bake at 350 for 30 minutes. Remove from pans and place on wire rack. Coat top of loaves with butter. 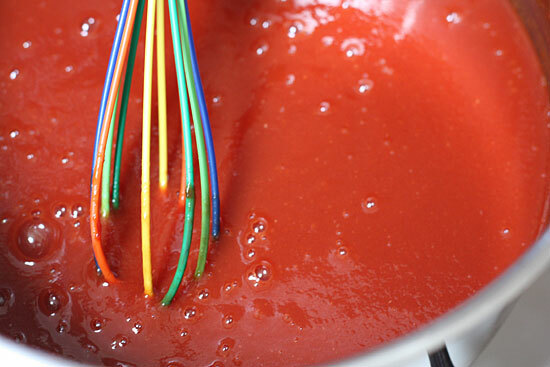 Making your own ketchup is so EASY to make at home and making it yourself allows you to control what goes into it. Ketchup is as American as apple pie, that sweet-sour combination on french fries are irresistible and who doesn't love it on their burgers! But have you ever checked the label of your favorite brand of ketchup? High Fructose Corn Syrup is used to sweeten most brands of ketchup although I did find organic Heinz ketchup in my health food store that does not contain HFCS's, but it was half the size at a higher price. 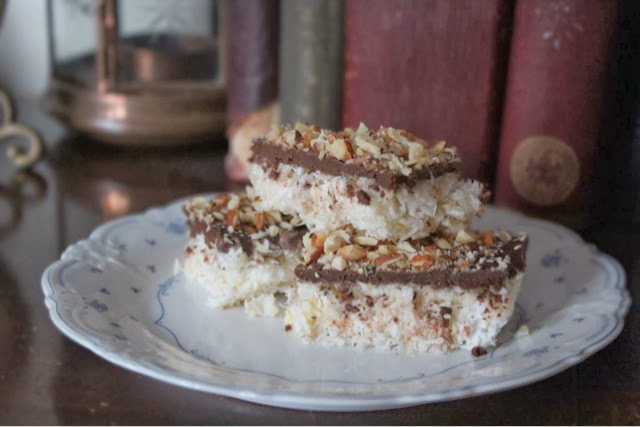 So I thought it would be fun to try making my own and tested and played around with a few recipes until I found one that I loved with some slight changes using honey as my sweetener. Remove from heat and cover until cool. Chill and store refrigerated in a covered container. Grease or line a standard sized 12 cup muffin tin. Set aside. In another bowl, whisk eggs until just beaten. Then whisk in honey, sour cream, and milk until blended. Then slow drizzle in the butter while whisking until combined. Add liquid mixture to the dry mixture and stir together with a spoon just until combined and all the flour is moist. Do not over mix. Divide batter between prepared muffin tin. Bake at 400 degrees for 14-18 minutes until golden. Allow to cool in tin for 5 minutes. Remove and serve.